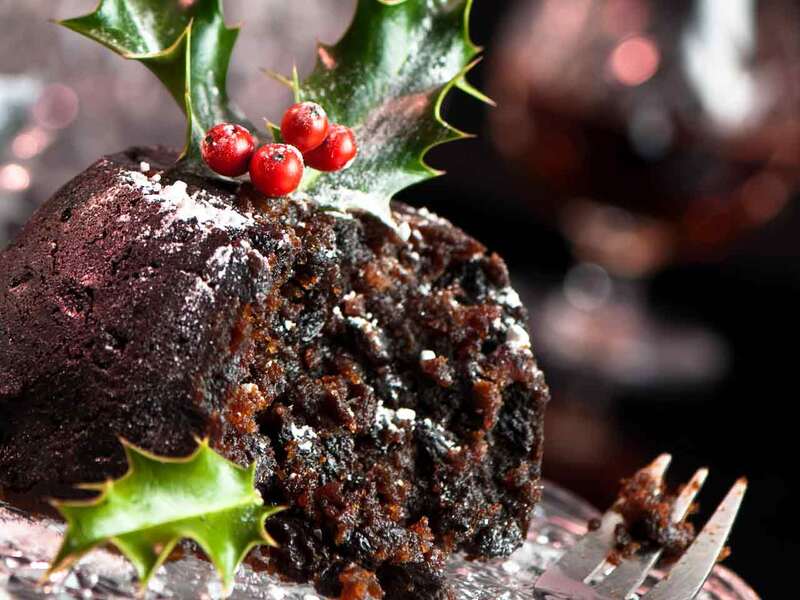 Dave's Figgy Pudding Recipe – ClearWord Communications Group, Inc. Butter a 7-cup pudding mold. In a small saucepan over medium-high heat, combine the figs, currants and 2 cups water and bring to a boil. Reduce the heat to low and simmer, uncovered, until the figs are tender but still hold their shape, about 20 minutes. Remove from the heat and let stand in the cooking liquid. Meanwhile, place the walnuts in a food processor and pulse to grind finely. Tear the bread into pea-size crumbs. In a large bowl, whisk together the bread crumbs, walnuts and flour. Using a slotted spoon, transfer the figs and currants to another bowl; reserve the cooking liquid. Halve 8 to 10 of the figs lengthwise and press them, cut side down, in a decorative pattern in the prepared mold. Coarsely chop the remaining figs; set aside. In a bowl, using an electric mixer, beat together the butter and brown sugar on medium-high speed until fluffy. Add the eggs one at a time, beating well after each addition. Beat in the milk and vanilla. Stir in the currants and chopped figs. Fold half of the flour mixture into the egg mixture, then fold in the remaining flour mixture. Pour the batter into the mold and fasten the lid. Place the mold on a rack in a large pot and pour in boiling water to reach halfway up the sides of the mold. Bring to a boil over high heat. Reduce the heat to medium-low, cover the pot and boil for 2 hours, being careful not to let it boil over and replenishing the water as needed to maintain the original level. The pudding should slowly steam. Remove the mold from the water and let stand for 15 minutes. Remove the lid, invert the mold onto a platter and tap gently to release the steamed pudding. In a bowl, using an electric mixer, beat the cream on medium speed until soft peaks form. Slowly add the granulated sugar while continuing to beat until stiff peaks form. Meanwhile, in a small saucepan over high heat, bring the reserved fig liquid to a boil and cook until reduced to 1/2 cup syrup, about 5 minutes. To serve, cut the pudding into 1-inch wedges, drizzle some syrup alongside and top with the whipped cream. Serves 8 to 10. 1. Combine butter, sugar, zest, mace, and salt in large bowl with electric mixer set at low speed; gradually increase speed to medium-high and beat until mixture is fluffy and looks almost white, 7 to 10 minutes. Scrape down sides of bowl. Combine brandy and sherry in liquid measuring cup. With mixer running, very slowly dribble in spirits until well combined. Turn mixture into airtight container and refrigerate for up to 1 week. Bring refrigerated sauce to room temperature before transferring to serving dish or it will separate. 2. Combine brandy and sherry in liquid measuring cup. With mixer running, very slowly dribble in spirits until well combined. Turn mixture into airtight container and refrigerate for up to 1 week. Bring refrigerated sauce to room temperature before transferring to serving dish or it will separate. What would you do with $10,000 worth of Google ads? The world’s best Key Lime Pie: The science is settled.